Last week I had to go to the Foreign Registration Office to re-register myself with my new visa. This has usually turned out to be a pretty tedious day, with an awful lot of waiting around - and the recommendation has always been to "bring a good book". Last week I took 2 very short ones and this post is about the books. 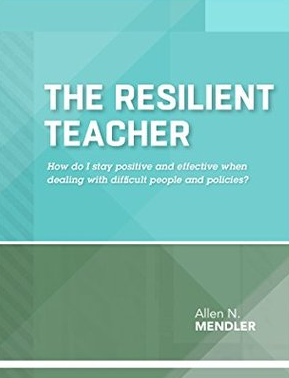 The first book I read was called The Resilient Teacher. I found this book to be focused on American teachers, who apparently have left the profession in huge numbers in recent years. The reason for this is that decisions that affect teachers every day are being made far beyond the classroom and that teachers have very little say in them. 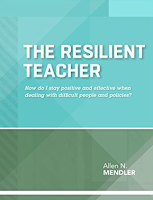 The focus of the book is on 6 attitudes that can build resilience and promote happiness in the profession. Be grateful - appreciate what you have because unhappiness is caused by thinking you deserve better than you have. Basically although teachers have a very challenging job, there is also plenty to feel thankful for - long holidays and the opportunity to impact the lives of young people every day. The recommendation is to spend 10 minutes on a Friday to email a list to yourself of 5 things you are thankful for that week - and then to read this list first thing on Monday. Sweat the small stuff - show students and colleagues that they matter - this can be as simple as saying hello to everyone or approaching someone you don't usually talk to and initiating a conversation. Have fun - make it part of your job. Challenge yourself to get better - do something different, master a new challenge. When you say it, mean it - require polite and respectful behaviour among your students. Surround yourself with a few fans - you need a social network. The book goes on to identify areas that can cause teachers stress and frustration and suggestions for dealing with these. They include policies, supervisors and colleagues, student behaviour, and difficult parents. The second book I read was called Stress Busting Strategies for Teachers. In this book good stress, which can enhance motivation and help us to do well, was distinguished from negative stress which can affect our mental and physical health. I remember a couple of years ago saying "I'm working harder than I've ever worked before, but I'm less stressed." However this year I have started to feel stress - not because of the job but because of the location of the job - so far away from my mother who has Alzheimer's. It's stressful trying to balance a job I love in India with a family I love in the UK. In a similar way to the previous book, I felt the audience was very much American teachers working in public schools Statistics from the US point to a decline in teacher satisfaction and in increase in stress. This stress is caused by many things: a lack of resources, difficult parents, poor student behaviour, unrealistic accountability measures and so on. Stress leads to teachers working less efficiently, which means they may have trouble meeting deadlines and end up feeling that work is piling up. What the book explains is that stress comes both from what we think - our mindset - and what we experience. Prioritizing - the suggestion is to make a 3+ list - these are the 3 tasks that you need to do that day to feel productive and successful. These need to be ranked, and then 2 more "plus" tasks added which are not urgent and simply bonuses. The idea is to focus on the 3 tasks and not to add to them, Once they are completed, cross them off and if you have time start on the 2 "plus" tasks. There are other suggestions for managing time, delegating tasks, setting parameters, getting organized, adopting a positive mindset, establishing strong communication skills, physical activity and mindfulness.